This community is located in historic Tucson, Arizona-Minutes from the shopping and business districts around the University of Arizona. Oracle Palms has everything you need to enjoy life in the desert. 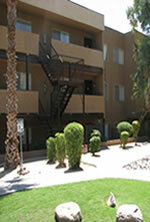 Our floor plans are open and spacious, our grounds are immaculate, and our rates are competitive. From I-10 exit Prince Road and head east to Oracle Road. Travel north on Oracle Road, one block north of Roger on the west side of Oracle.